I finished my first painting at the Maggie Price workshop by lunchtime, so after another wonderful lunch I started a second painting. 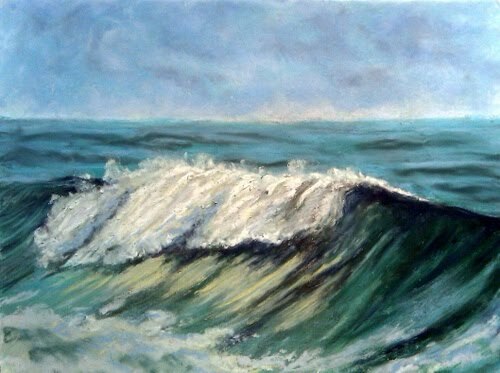 One of the other women was working on a wave painting, and I was a bit envious as I have long yearned to learn how to paint waves - something I'm clueless about! But as I looked through my reference photos I found I did have a pretty decent shot of a wave I'd taken down in North Carolina, and decided to give it a shot. Some great advice from Maggie, but I'm still not very happy with it. Oh well, it's my first wave ever, and I'm sure I can get better at it with practice. Practice is the key, jsut as in most things. Like all my other workshop paintings this is on 9x12 white Wallis paper with an underpainting. Today we had to do underpaintings that used only one color, but just 4-6 different values within that color. I chose turquoise for the color of the underpainting for this one, and magenta for my Beach Rocks painting.